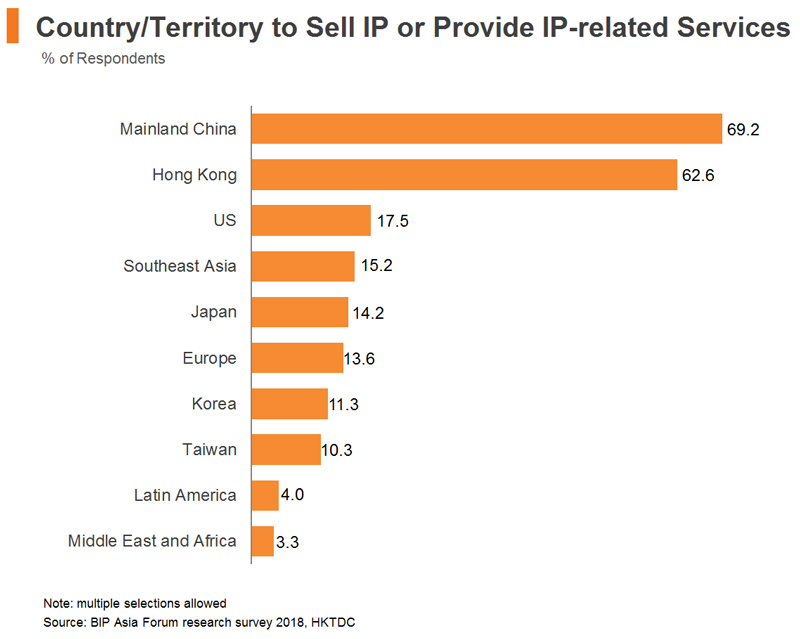 Hong Kong remains the most important IP trading hub in Asia, according to a recent HKTDC survey of more than 300 IP professionals and industry players who participated in the BIP Asia Forum in December 2018. The survey results suggest an optimistic near-term outlook of the IP trading as industry players continue to increase their sourcing and selling of IP or related services. Thanks to its excellent geographical location, the low-rate and simple tax system, Hong Kong remains a preferred place for IP trading. However, the city will be facing keen competition from Singapore and Shanghai in the coming years. 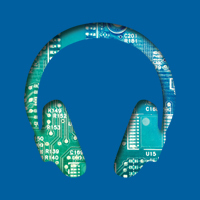 In today’s competitive business environment, IP is a valuable intangible asset for companies which have invested in R&D and product innovation. 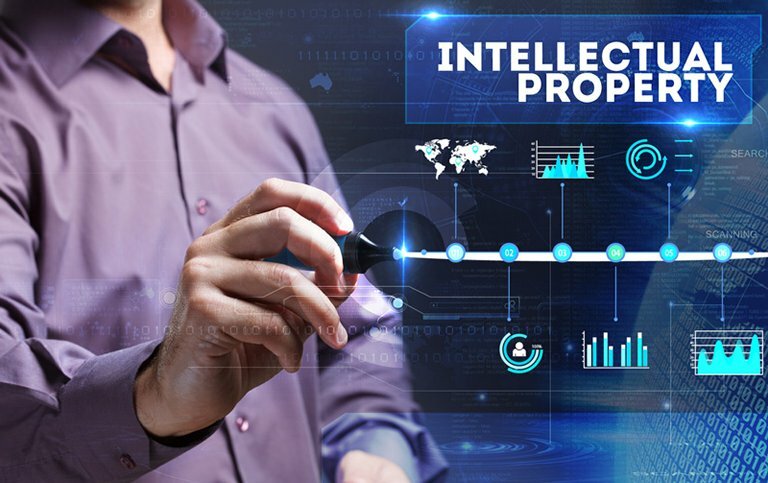 Along with the rising role of innovation and technology among Asian economies, there is a growing recognition of IP as an asset that can generate revenue through licensing, and be used as collateral for financing. In 2017, the number of global IP applications in patents, trademarks and industrial designs reached record levels - with Asia accounting for more than 60% of them. 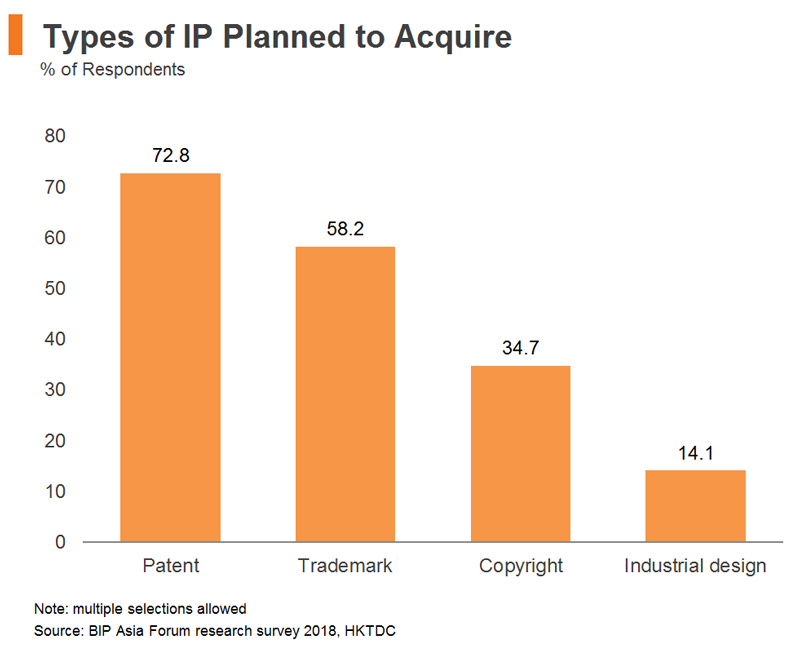 50% of respondents in the HKTDC survey had engaged in IP registration and protection in the last 12 months; 38% had carried out IP consultancy and 36% had conducted IP licensing. In line with their business activities, most respondents were interested in IP legal services/litigation (36%), IP commercialisation (33%), IP portfolio management and consulting services (27%). As IP rights are protected only in accordance with the laws of the country or a region in which they have been granted, multinationals and exporters face relatively higher risk of IP rights infringement than other companies do because they produce, sell and operate in different countries. This is especially true if they are doing business in emerging markets, some of which have relatively weak IP rights protection and awareness. Due to the territorial nature of IP, companies need to register IP rights for products in multiple jurisdictions when they diversify their manufacturing bases or export markets. The process of seeking IP protection and enforcing IP rights abroad can take up substantial time and financial resources, including the fees for IP attorneys and the manpower for the preparation of technical documents. 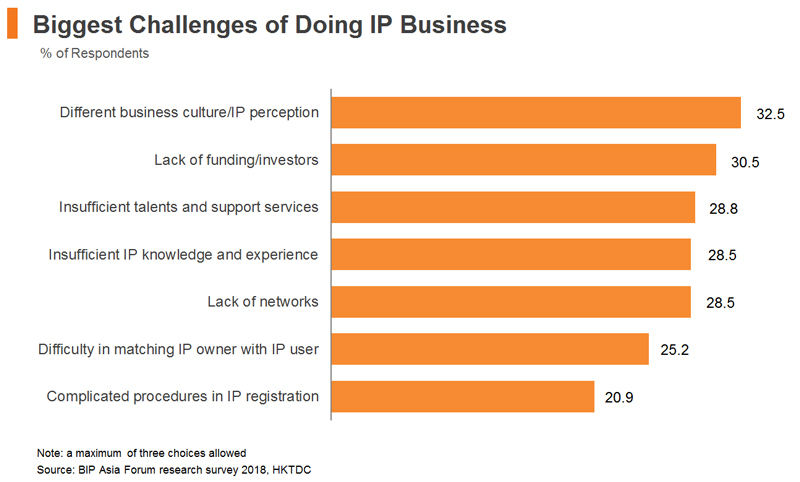 Respondents in the survey reflected these worries, with 33% saying that the main challenge when conducting IP business was the difference in business culture or IP perception. 31% cited the lack of funding or investors as the main challenge, while 29% pointed to insufficient talent and support services. On a more optimistic note, the survey results pointed to a positive outlook for the demand for IP, with more than 90% of respondents planning to increase sourcing and acquisition of IPs in the next two years. Nearly half (49%) of the respondents plan to source from Mainland China, 43% from Hong Kong and 17% from the US. Patents (73%) and trademarks (58%) are the most sought-after types of IP. On the supply side, more than 95% of respondents said that they plan to sell IPs or provide IP-related services in the next two years. 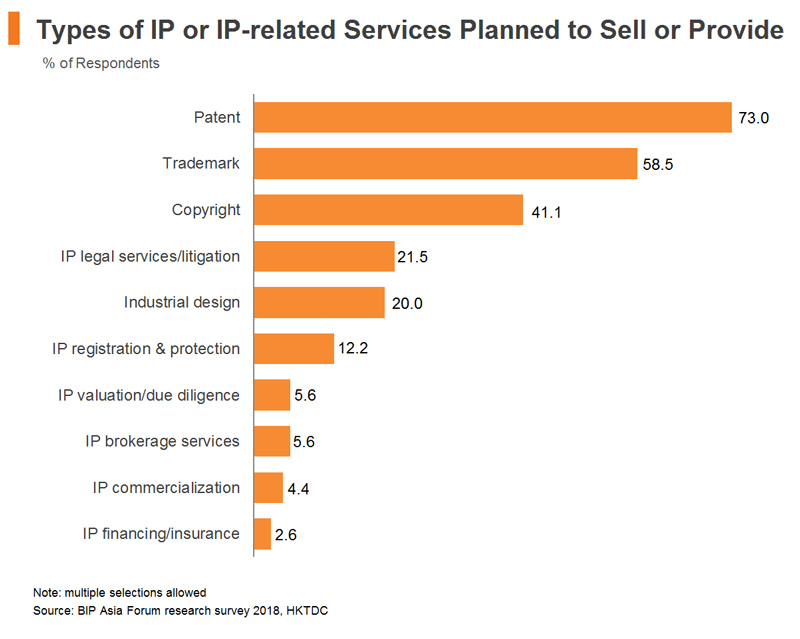 Again, Mainland China (69%) and Hong Kong (63%) are the preferred markets, with patents (73%), trademarks (59%) and copyrights (41%) being the most popular IP categories on offer. This matches well with the market demand described above. Apart from being a springboard for overseas companies looking to enter Mainland China and the regional market, Hong Kong is also a preferred platform for many mainland companies looking to expand their businesses abroad. This makes Hong Kong a popular place for overseas companies to register their IPs. Hong Kong provides them with a simple, cost-effective registration system under which patents approved in recognised regimes such as the UK, EU and the Chinese Mainland can be re-registered. The city handled more than 13,000 patent applications and 70,000 trademark registrations in 2017, and is ranked among the world’s top 20 IP offices for patent application and trademark registrations. Compared to other IP application offices, Hong Kong handles a relatively high share of non-resident IP applications, reflecting the city’s business potential for foreign IP owners looking to commercialise their IP in the region. In 2017, non-resident patent applications in Hong Kong accounted for 98% of the total, far higher than the average among Asian application offices of 16% and the global average of 29%. Most patent applications in Hong Kong originate from the US, Japan, Mainland China and Switzerland. 80% of the respondents who had engaged in IP-related business in the past 12 months had conducted that business in Hong Kong. 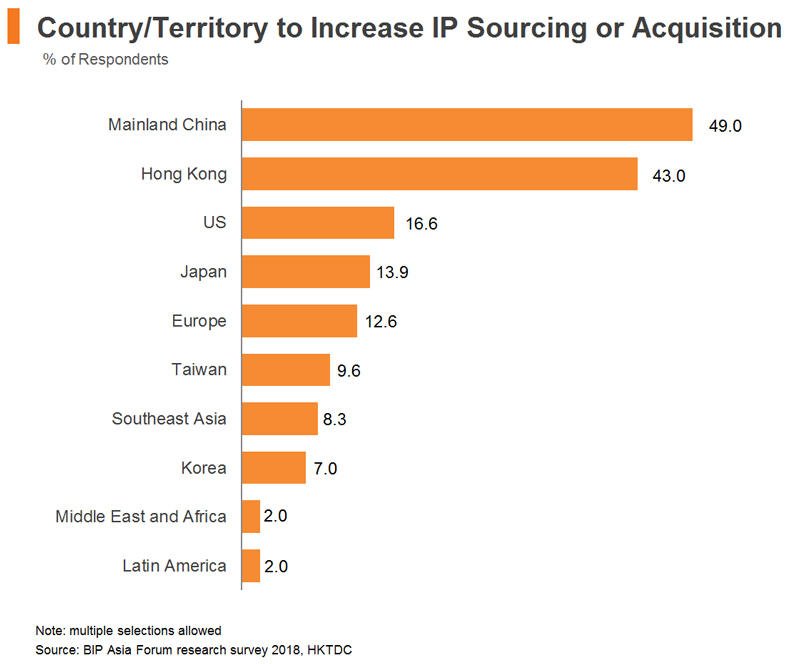 Of those who had conducted IP business outside Hong Kong, most had done so in Asia (88%), with the most popular locations being Mainland China (60%), Taiwan (8%) and Singapore (8%). 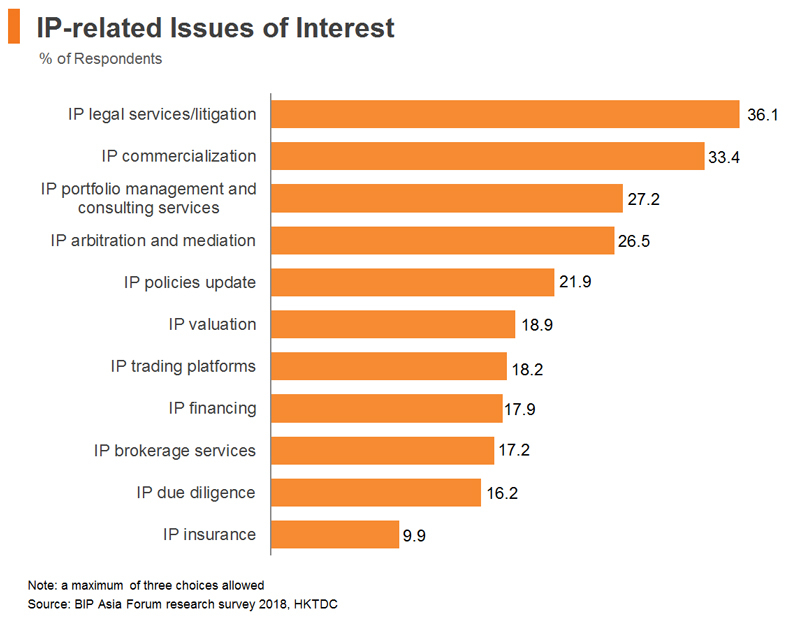 More than 80% of the respondents indicated that they are likely to consider or continue using Hong Kong for IP trading in the next two years. 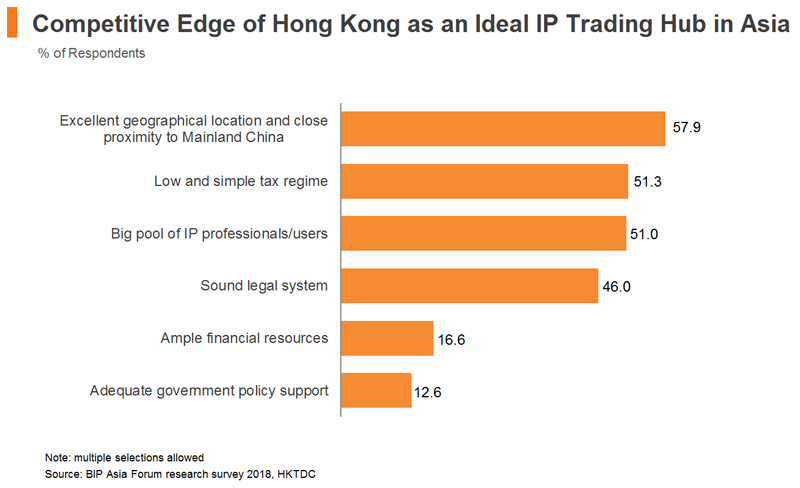 58% chose the city’s excellent geographical location as one of the reasons for conducting IP trading in Hong Kong, while 51% cited its low and simple tax regime. Hong Kong’s pool of IP professionals/users was also picked out by 51% of respondents as one of the factors that gives the city a competitive edge as an IP trading hub in Asia. Hong Kong compares favourably with Singapore and Shanghai in several key attributes of IP trading environment, particularly in terms of tax rates, legal environment and IP protection. Hong Kong boasts one of the world’s lowest corporate tax rates. 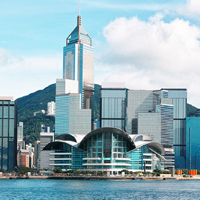 In April 2018, Hong Kong adopted the two-tiered profits tax regime, replacing the previous standard tax rate of 16.5%. Under this system, the first HK$2 million of profits is taxed at 8.25%, with the remainder being subject to the 16.5% rate. This is significantly lower than the 17% rate in Singapore and the 25% rate in Mainland China. 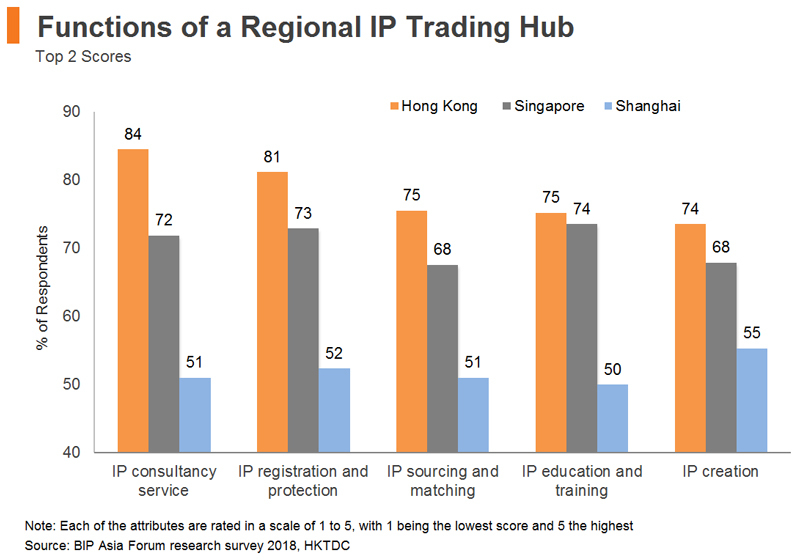 Hong Kong also outperforms in terms of IP trading hub functions, scoring the best ratings among the three cities, particularly in the areas of IP consultancy service, IP registration and protection. However, in terms of IP education and training, IP financing resources and IP professional services, Hong Kong’s lead over Singapore is very narrow, suggesting a keen competition between the two cities. Singapore has for some time been attempting to nurture a pool of IP professionals. In 2003, the Intellectual Property Office of Singapore (IPOS) established the IP Academy which provides IP training programmes for the public and customised courses for corporations. 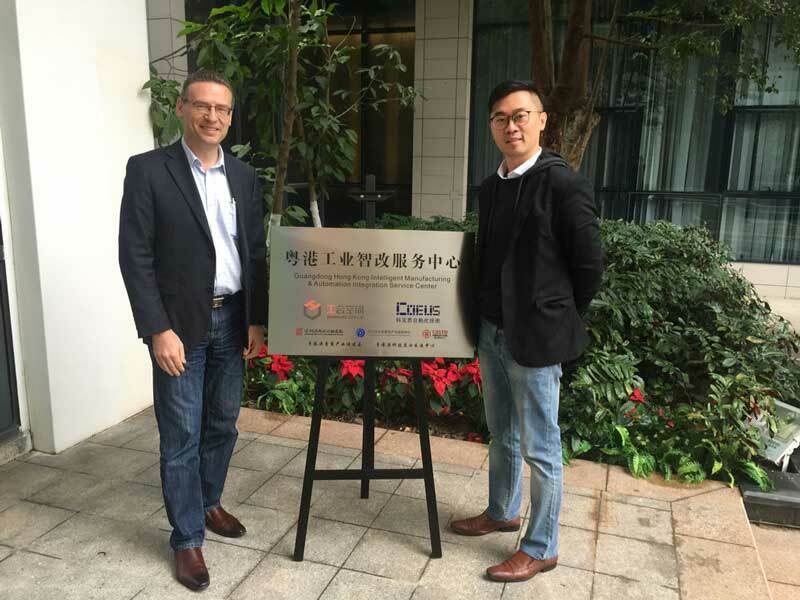 Hong Kong in turn has introduced initiatives to build up its IP manpower in recent years, including the IP Manager Scheme launched by the Intellectual Property Department in 2015, which provides IP training programmes and workshops for Hong Kong companies. 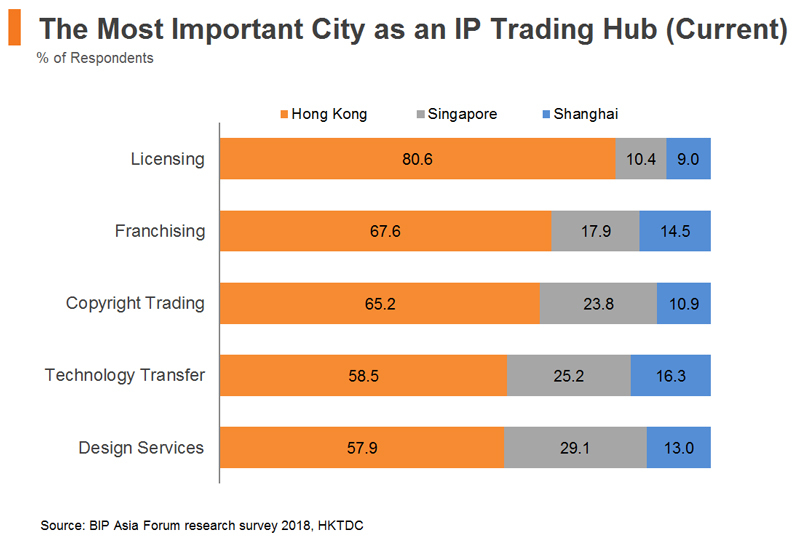 HKTDC’s survey results show that Hong Kong is currently regarded as the most important city of the three in all areas of IP trading. More than 80% of respondents chose it as the most important city in IP licensing, 68% in franchising and 65% in copyright trading. However, although Hong Kong is expected to maintain its leading position in all IP areas in the next five years, the perception is that both Singapore and Shanghai are catching up quickly. This is particularly true of Shanghai, which is becoming much stronger in terms of design services, technology transfer and licensing, outpacing Singapore. China, which is making significant progress in technological development and home-grown innovation, has emerged as the leading driver of IP applications globally. In 2017, China received 1.4 million applications for patents and 5.7 million for trademarks, more than 40% of the world’s total - a rise from about 13% a decade ago. Shanghai is the country’s leading city when it comes to the commercialisation of innovation and technology and is home to several key technology transfer centres, including the Shanghai Technology Transfer and Exchange, the National Eastern Tech Transfer Centre, and numerous technology transfer offices established by the city’s universities. 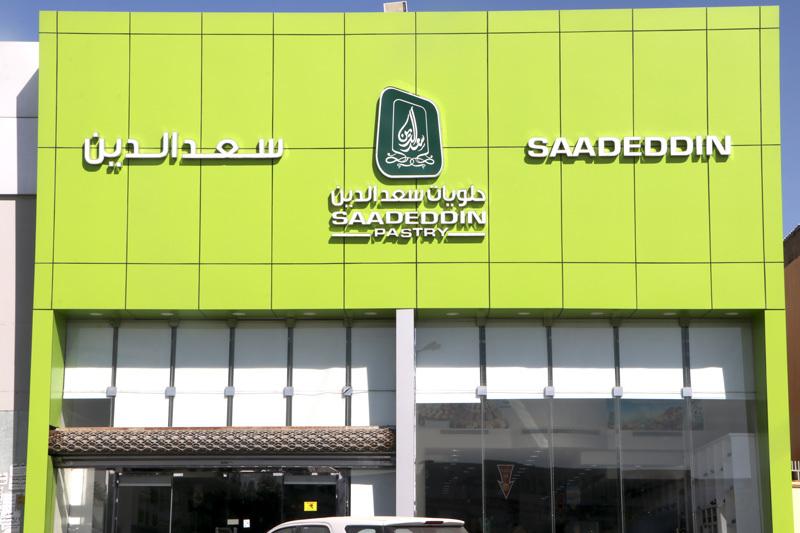 These platforms act as intermediaries for the import of foreign technologies and the commercialisation of technological innovations from local institutions. 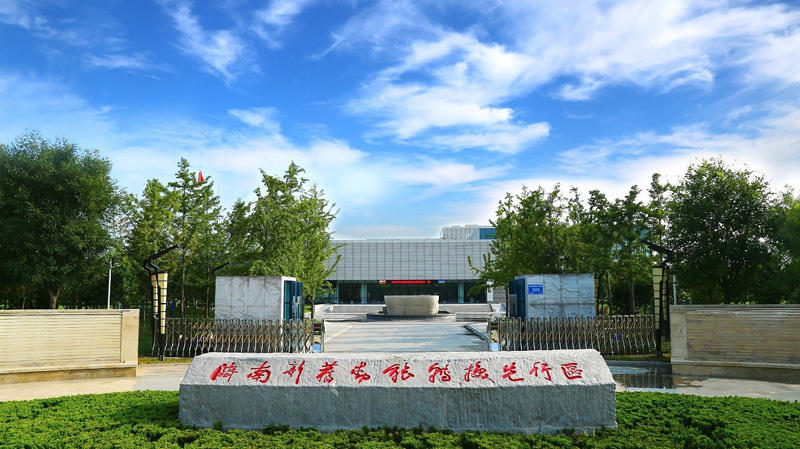 Given China’s ongoing industrial upgrading and its adoption of new technologies like artificial intelligence (AI) and robotics, technology transfer activities in China are expected to flourish in the near future. Hong Kong professional IP services providers, with their extensive market knowledge of the mainland, could play an increasingly pivotal role in facilitating IP commercialisation in China. Apart from the importation of overseas IP, Hong Kong IP specialists can develop customised IP portfolio strategies for Chinese IP owners and identify IP licensing opportunities overseas. Main business nature: IP service providers (58%), IP owners (23%), associations and public organisations (12%) and IP users (8%). Location of main business: Hong Kong (50%), Mainland China (33%), other Asian countries (9%) and US/Europe (5%). 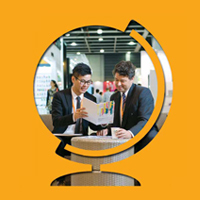 The eighth edition of the BIP Asia Forum was held on 6-7 December 2018 at the Hong Kong Convention and Exhibition Centre (HKCEC). 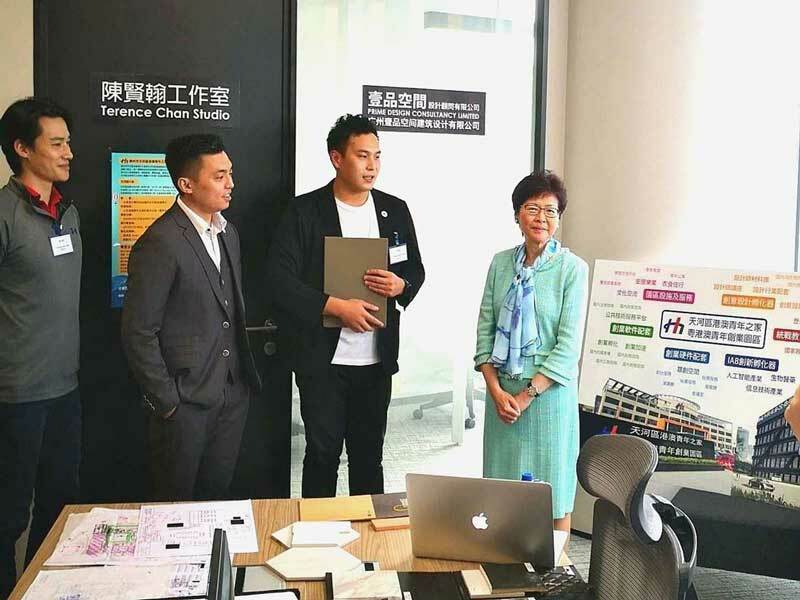 Jointly organised by the HKSAR Government, the HKTDC and the Hong Kong Design Centre, the forum gathered IP professionals and industry experts to share their insights and explore collaboration opportunities. In the China Regional Technological Innovation Evaluation Report 2018, Shanghai was rated as having the highest technological innovation level among the 31 municipalities and provinces assessed in the report.